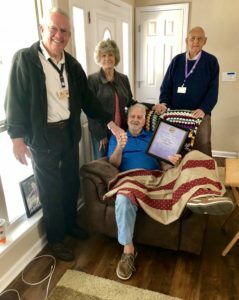 Live Oak residents Carlton Peppers, Ruth Taub and Mead Worley and were recently recognized for their military service by Haven Veteran Volunteers. Peppers served in the United States (U.S.) Army during the Cold War. Worley served in the U.S. Air Force during the Korean War. World War II Air Corps Veteran Ruth Taub served in the Meterology Bureau at the Pentagon and helped forecast the weather for the Normandy Invasion. Haven Pinning Ceremony for veteran patients includes a veteran pin, a thank you card signed by the staff and a certificate of appreciation from Haven which are all presented by volunteer veterans. The presentation ends wit h a salute to honor the veteran’s service. 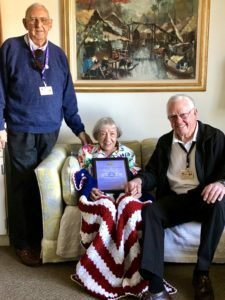 In the Photo (l. to r.) Haven Veteran Volunteer Wally Reichert, Ruth Taub, Haven Veteran Volunteer Bill MacGrath. 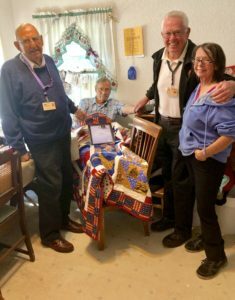 Haven Veteran Volunteer Wally Reichert.